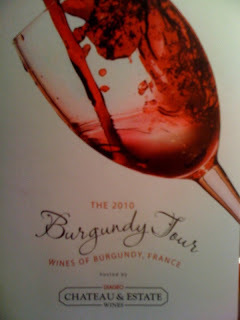 Recently I was invited to attend the 2010 Wines of Burgundy Tour held at the St. Francis in San Francisco. Outside the weather was dark and stormy, but inside, once the tasting commenced, things instantly became warm and cozy. This event was for the trade, so most everyone there was well acquainted with the wines and the growing regions, but it was all new to me. 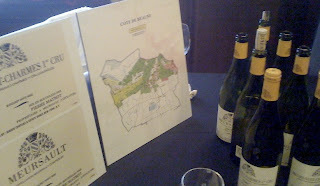 I found it helpful that each table had a map indicating where the wine was from and I loved the big map at the entrance that showed the entire Burgundy region. I subsequently learned that the wines of Burgundy are classified by the vineyard location not the winery name or producer’s name. I really appreciated the lower alcohol level of the wines. The majority were in the range of 13 to 13.5 % and I found it a huge difference, a good difference, compared to the wines of California that I normally drink. I became interested in wine when I lived in Italy and most of my wine experience is with Italian wines that have lower alcohol levels as well. 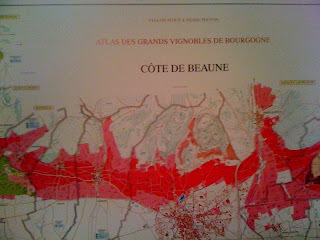 Overall I found the wines of Burgundy to be true food lovers wines and more in line to my tastes. I recently completed my third Wine Sensory Experience class and believe it has deepened my ability to appreciate wine and understand the complexity of what I taste. The 2007 Premier Cru Chassagne-Montrachet Les Chenevottes was a delight-- a virtual vanilla cream peach puff of pleasure. Ooh La La – I liked this one very much. 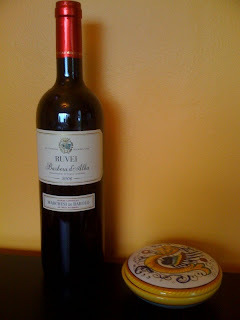 It was a harmonic convergence of wild honey and spicy tropical fruit, with a good balance of acidity and oak. It reminded me of a light flakey croissant with a creamy butterscotch finish. All breakfast pastries should be this good. Grand Vin de Bourgogne Puligny-Montrachet 1er Cru Les Folatieres 2007-- Honestly, I don’t know what all the designations on the labels meant, but the wine needed no translation--It was full of flavor, bright citrus and crisp apple with a tiny hint of musk scent. This was a wine that begged you to order room service and spend the day getting to know one another. Amazing. I wanted to run-away with this wine. I found hints of chocolate and leather and what I wrote in my notes as “warm puppy belly”. And that was it. 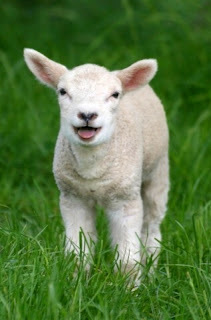 It had that happy scent of warmth and pure joy a puppy has that makes you want to just to snuggle up to it. Okay, so maybe I should have been spitting more before I came up with that description. But a restaurant owner I met tasting at the same table agreed that warm puppy belly summed up that wine most succinctly, so don’t be surprised if you see that as a tasting note somewhere soon, paired with pork belly or something like that. But remember, you heard it here first. This wine was the epitome of French to me: Pepper and spice and everything nice with light tannins and a bouquet to take me away. Catherine Deneuve in a glass. In my notes I wrote: “Wow!” Honest and bold. It smelled like French teen spirit and it rocked in a most delightful way! Can your palate change in an afternoon? Probably not, but you can certainly be awakened. Later that same evening I tried a Cabernet with a 14.5% alcohol level and it was like drinking syrup or Smuckers jam straight from the jar. Ugh! In the past I liked this heavy style of wine, but suddenly I was put off by it. I also tried a Pinot Noir made in Dry Creek I’d recently bought, but now it seemed way too harsh and it just made me sad to drink it. I longed for the refined and delicate French wines I’d had that afternoon. There was something ethereal, transcendent about them. I wanted to experience more. So thank you France for the wake up call. It was a truly educational and palate expanding. And thank you to Marie Griffin and Jill Deaver for extending me an invitation. Next stop France! After I posted this I saw an article that stated this would be the last year Diageo would be the importer of he wines. So that’s sad news, but now I feel even more fortunate that I was able to taste and experience these exceptional wines that for the most part are well out of my price range. CORRECTION: Although Diageo has chosen not to participate in the 2008 or 2009 Bordeaux futures, they WILL continue bringing these fine Burgundies into the States. 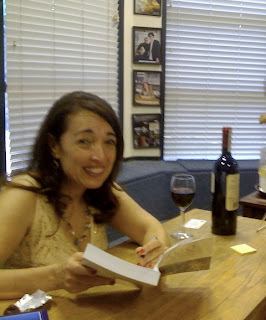 A few weeks a go I attended a book event at Book Passage featuring Susan Van Allen and her new book 100 Paces In Italy Every Woman Should Go. Susan gave great slide presentation on the goddesses in Italian art and tips for women traveling to Italy. The event included a wine tasting of Ruvei Barbara d’Alba made by Marchesi di Barolo, one of the women owned wineries mentioned in the book. Marchesi di Barolo located in the Piedmont region is run by Anna Abbona whose family has owned the winery in the city of Barolo since 1929. The estate of Cantine dei Marchesi includes some of the finest vineyards in the district. In honor of International Women’s Day which is (today) Monday March 8th I am going to open a bottle and toast the special women in my life past and present. So here’s to you ladies. Enjoy a wine from a woman run winery or winemaker today, and get yourself a copy of 100 Places In Italy Every Woman Should Go by Susan Van Allen.